Our newest tour launched last month and we are so excited for you to experience this latest adventure with us the next time you visit Maui! Skyline Hawaii’s Road to Hana tour takes you to all of the epic sites without anyone in your group needing to hold their breath around the 600 hairpin turns on this grand road. 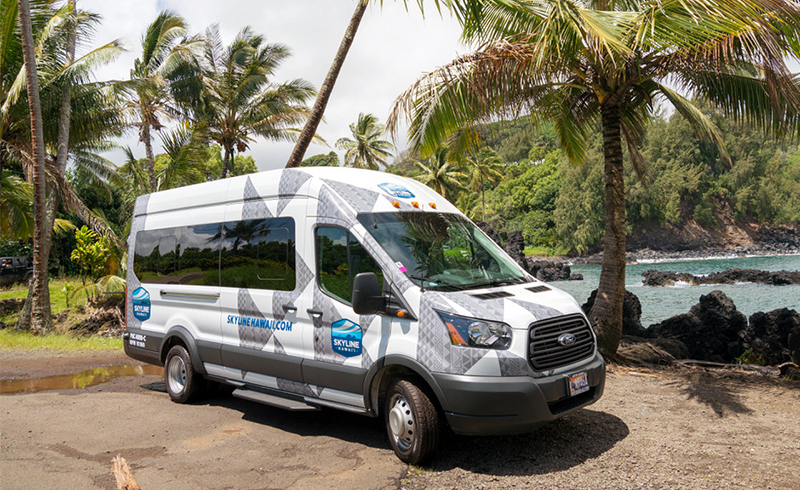 Our tour buses are the perfect size for your whole group to enjoy 360-degree views of the Road to Hana together. Our tour guides are expert drivers and know all of the local insider information about the Road to Hana you could possibly ask for. You can ask them questions about anything you see along the way and they will tell stories about Hawaiian cultural history. We offer this unforgettable tour 6 days per week- every Monday through Saturday- so you can choose the day that works best with the other activities or relaxing beach days that you have already planned to spend here on Maui. The Road to Hana is famous for the journey more than the destination and no Maui experience is complete without an adventure on this beautiful, historic, epic road, so why not explore it the right way? When you choose to experience the Road to Hana with us, your day starts with our friendly guides picking you up right in front of your hotel so you can enjoy the whole day from the time you wake up without having to worry about finding parking or navigating to our office. We are the proud owners of Maui’s newest fleet of guided tour vehicles. 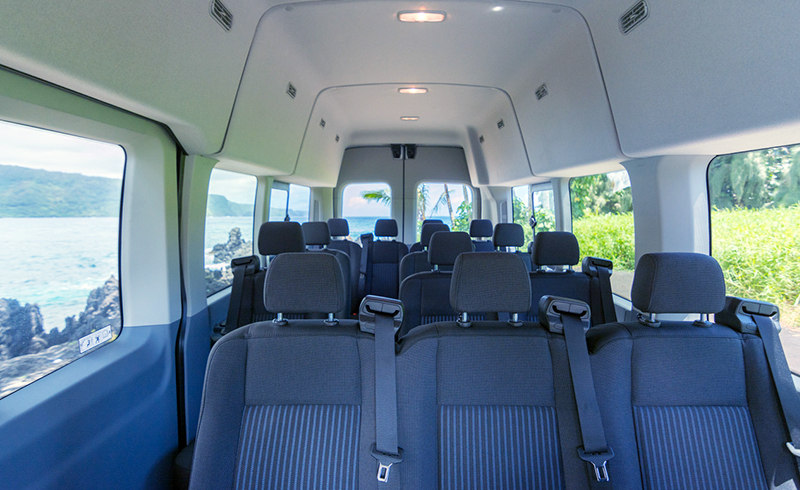 These vans offer the most comfortable ride possible for you to enjoy during your tour. They have large viewing windows and elevated seating so you get 360-degree views of every rainforest landscape, waterfall, and incredible natural lava rock formation along the way. If you drive yourself on the Road to Hana, it is important to consider what type of rental vehicle you will be driving. Most cars have blind spots and limited window widths so you are sure to miss some of the views along the way. Also, when you book a rental vehicle it is almost never guaranteed that you will get the vehicle you choose online in advance. So you might choose a vehicle with larger windows but get stuck with a less desirable alternative depending on what the rental office has available. On the other hand, if you book a tour with us, you know you are going to get a great viewing experience. We make sure the experience is enjoyable with comfortable seating, climate controlled interiors, and other luxury features for every guest to enjoy. Our large windows in our vans make it possible to have unmatched photo opportunities throughout the whole tour and our professionally trained guides will make sure you don’t miss a thing along the way. Our guides are NAI Certified which means they are certified by the National Association for Interpretation to give you a guided narrative along with way, including the history of the area, local flora and fauna, and the cultural significance of the Road to Hana. This is all information that you would never learn if you would choose to navigate the Road to Hana on your own. This tour includes breakfast at Jaws Country Store and lunch at Hana Fresh. Jaws Country Store was named after the world-famous big wave surf break, called Jaws. The restaurant is located directly south of the world-famous Jaws beach, knowns as Pe’ahi. Lunch at Hana Fresh is always a delicious and nutritious treat. You will get to taste the best local produce and ingredients that Maui has to offer when we stop here for lunch. The Hana Fresh farm stand has a beautiful, shaded outdoor picnic area where you can sit back, relax, and take in Hana’s beautiful views while you enjoy lunch. Be sure to bring your swimming suit and towel on this adventure because we have exclusive access to swim in a freshwater waterfall pool as part of this tour! The waterfall swimming stop is in Pua’a State Park. You can also go for a swim in beautiful Hana Bay after lunch. The water is nice and calm here so it is a popular spot to swim or go canoeing. The thing that makes Hana Bay’s beach so unique is its black sand. The sand is black on this beach because it is made of lava that erodes in the ocean and then washes up into the bay. Some of the other exciting things you will see on this tour include Ho’okipa, Kaumahina State Park, Ke’anae, Waianapanapa State Park, and Wailua Falls, just to name a few. Ho’okipa is a great spot to see impressive surfing in action. Kaumahina State Park has a lookout point where you can take in some spectacular ocean views and a great view of Maui’s North Coast. 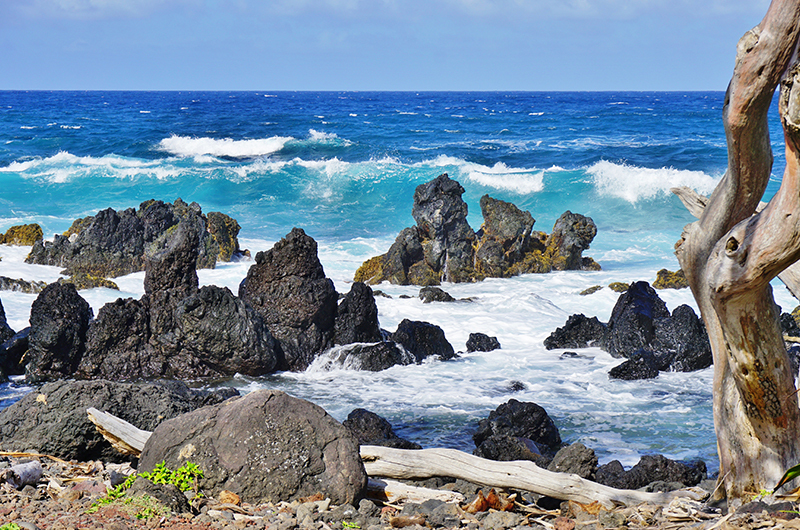 Ke’anae has a unique rocky coastline that is formed of huge lava rocks that have settled here throughout history. We will also travel through Waianapanapa State Park which boasts a beautiful black sand beach and freshwater caves that powerful Hawaiian legends call home. Wailua Falls is considered the perfect falls by many people. This is due in part to its perfect location. The waterfall is located right on the Road to Hana along a bridge so you can’t miss it. Did you know that the world-famous pilot Charles Lindbergh is buried along the Road to Hana? We will stop here too so you will be able to see some of the prettiest churches on Maui. We will also drive over Manawainui Gulch. The backside of Haleakalā is just as beautiful and unique as the summit! FUN FACT: Our new vehicle design honors the last great ancient Mō’ī of Maui, Kahekili Nui ‘Ahu Manu, who ruled Maui from 1766 – 1793. We believe our vehicles provide a unique opportunity to share the rich history of Maui, and by honoring Kahekili with our design we hope to draw attention to the history and culture which existed in Hawai’i for more than a thousand years before Captain Cook first sighted the Islands in 1778. These are just a few of the highlights of this adventure. The Road to Hana has waterfalls around almost every corner, countless beaches, charming little towns, and beautiful rainforest landscapes. It is incredible that so much beauty can be in one area. This is why it is so important to take a tour with certified guides in a van with large viewing windows because you will want to be sure to not miss a thing on this incredible tour. Our Road to Hana takes you on a total loop of South Maui so you will get to enjoy every aspect of what our island has to offer. The whole tour is 114 miles long. Let us drive you so you can get the most out of your unforgettable day. Ensure everyone in your group can enjoy the breathtaking views along this route by choosing to take a guided tour with Skyline Hawaii. When you join us for a guided tour, you will be able to sit back, relax and enjoy the ride while we navigate the sharp corners and rugged terrain. Our Road to Hana tour costs $159.95 per person when you book online. This tour lasts about 12 hours. 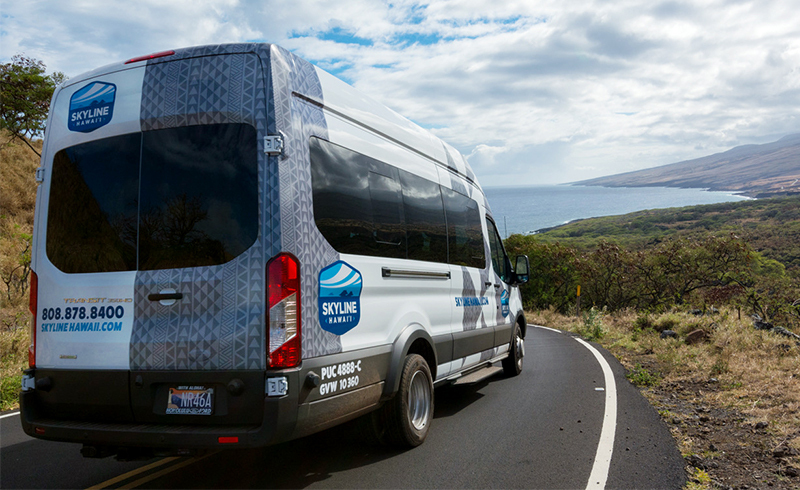 About the Author: Join Skyline Hawai’i and be transported in comfort with Maui’s newest fleet of tour vehicles. Each brand new vehicle features extra-large viewing windows, comfortable seating, and a climate controlled interior. For more information or to make your reservation today, visit: www.skylinehawaii.com.